What’s baked into the cake of a great place to work? The recipe starts with leadership and vision. And it includes ingredients that not only energize employees, but empower them to drive the organization forward—and in that sense, take ownership of the company’s fate. That ingredient list can be long and varied, but it invariably includes superior compensation and benefits packages, exceptional workplace culture and attributes, well-defined goals and internal processes that help those employees achieve them. 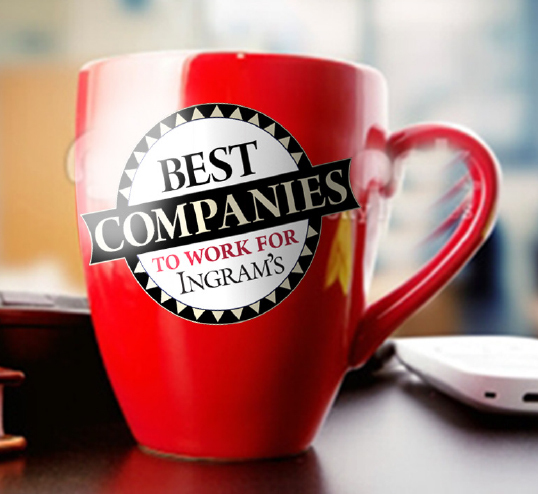 For nearly 10 years, Ingram’s has sought to identify those employers whose workplaces define best practices, and this year’s winners deliver on that goal once again. From flexible scheduling to job-sharing, generous paid time off to retirement savings plans, ping-pong table in the break room and Beer Fridays to wrap up a week of hard work, these companies are finding better methods of telling employees just how much they are valued. So join us, please, in saluting this year’s winners, and the nearly 100 other companies similarly recognized since this feature debuted in 2008. We hope their examples will be an inspiration to all employers who reach for the mantle of Best Companies to Work For. When they talk about diversity at Kansas City Power & Light, it is not corporate lip service: Its work force of 2,921 strong presents the challenges of blending workspaces for both union and non-union employees, and like any public company, the pressure is constant to ensure best-practices adoption of boilerplate diversity initiatives. Getting your arms around those respective factions, and unifying them into a cohesive force, starts with foundational values that the utility calls its Guiding Principles. They form a set of convictions that, the company says, “affirm the value of people, including diversity and inclusion, safety, honesty and integrity.” From that, says Kelly Murphy, senior director of human resources, flow innovation, flexibility and an understanding that everyone on the staff is charged with being a good steward of all resources. From the benefits offered, it’s clear that the company considers its employees a valued resource. Most impressive is its commitment to their long-term welfare—in addition to a 401(k) plan that itself offers a generous match of up to 6 percent of eligible contributions, there are add-ons for both union workers (a cash-balance pension) and an additional 4 percent for non-union employees, who then can sock away 10 percent of their annual compensation each year. That’s built upon a compensation foundation grounded and remaining competitive with other large utilities, and annual incentives for non-union workers for attainment of corporate and individual goals. 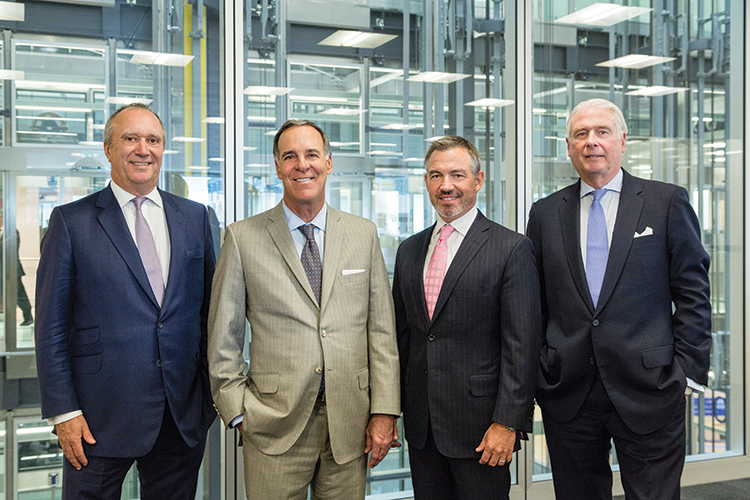 (l-r) Mike Hammond, Chairman, Lockton international operations; David Lockton, Executive Chairman; Ron Lockton, Vice Chairman; John Lumelleau, President and CEO. Stop. Right. There. Beer Fridays and weekly visits from massage therapists? Were those the only perks offered at Lockton Companies, it would still be a terrific employer. But there’s so much more about Lockton that appeals to employees and prospective hires alike. Those traits explain precisely how a company, in less than 50 years, can start with one man selling insurance from his home and blossom into the largest privately held independent brokerage in the world. Lockton’s is an entrepreneurial culture infused with success: Company revenues (topping more than $1.3 billion in 2015) have grown every year since its founding in 1966, and the guidance Lockton provides to corporate clients, including more than 170 Fortune 1000 companies, adds up to a client retention rate of 96 percent—fully 11 points above the industry average. The strategy is grounded in a flat structure whereby responsibility and accountability are distributed across 70 global offices. Each has its own president and chief operating officer and the aggregate they manage is a work force of 6,000. Seated (l-r) Cheryl Vohland, COO and CSO; Kara Stoecklein, Senior Vice President of Human Resources; Anne Dorian, Senior Vice President of Regulatory Compliance. Standing (l-r) Tae Kim, Vice President of Marketing; Julie Pine, Vice President and General Counsel; Jeff Foley, Senior Vice President of Technology; Andy Crawford, Vice President of Finance/Accounting; Katrina Radenberg, Managing Director & Product Development; Christa Spencer, Vice President of Marketing. Ten years ago, Mariner Wealth Advisors lit the fuse, launching with $300 million in assets under management. That rocket has gone nowhere but up, and today, it’s one of two dozen operating units under parent Mariner Holdings, which has a combined $35 billion in assets under management—nearly 117 times the original Mariner’s size. The Leawood-based family of investment advisory firms has achieved that growth in large part with acquisitions, but also with the kind of organic growth that comes from adding 200 employees in a single year, as it did in 2015. That was an increase of nearly 50 percent from just a year earlier. The company has enjoyed a comparatively low employee turnover rate (associate retention is above 90 percent over the past five years), and is planning for more hiring with a new headquarters now under construction and a projected move in the spring of 2017. So what drives that kind of growth? For a company that is no longer strictly a logal player, but operating on a global scale, it starts with industry-competitive and innovative salary structures, including opportunities for performance-based bonuses. Employees and their dependents get health insurance that’s about as close to free as it comes—the company pays 98 percent of the premiums, with additional coverage for dental, vision and life/disability insurance, plus flexible spending accounts. Complementing 401(k) plan with a 3 percent company match are goodies like health and financial-wellness programs, on-site massage, chiropractic and acupuncture services, alternative work arrangements that include flexible hours, telecommuting, reduced/compressed work schedules and paid parental leave. 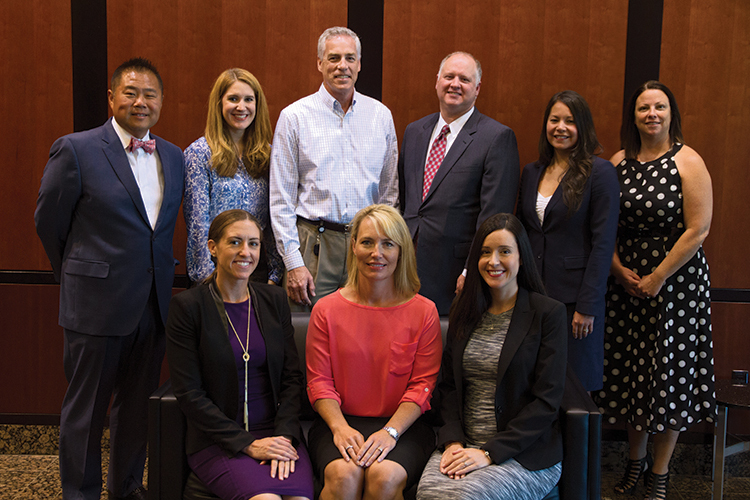 For new employees, the firm has rolled out Mariner Connections, a new on-boarding and education program, and for experienced staff, there’s a suite of leadership development programs. Associates also have open access to senior leaders across the firm, thanks to a flat management structure, and Mariner Academy is the company’s in-house organ to keep advisers knowledge bases current, and tuition reimbursement helps associates earn advanced education and necessary certifications. 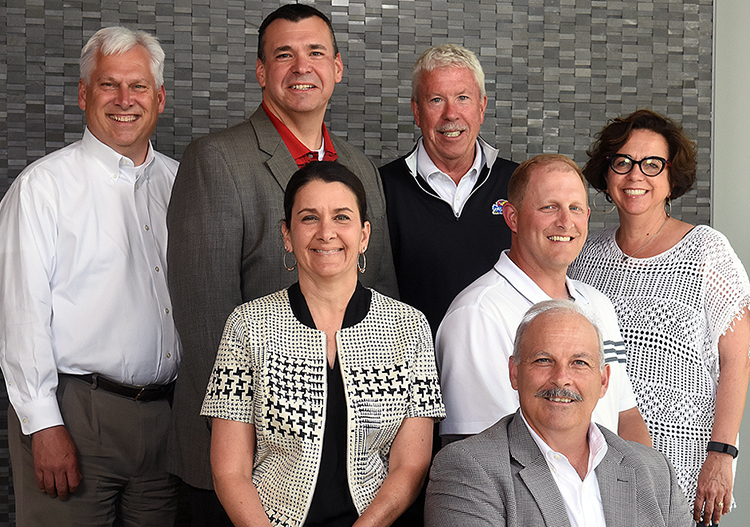 Front Row (l-r) Davin Turner, President Mosaic Life Care Clinic; Jon Doolittle, Regional President Northwest Medical Center; Dana Anderson, Long Term Acute Care Hospital Administrator; Curt Kretzinger, Chief Operating Officer; Lisa Michaelis, Chief Life Care Officer. Back row (l-r): Tony Claycomb, Program Leader Clinic Operations; Chris Bennett, Support Services Administrator; Linda Bahrke, Accountable Care and Population Health Administrator; Mark Laney, Chief Executive Officer; Brennan Lehman, Chief Information Officer; Michael Pulido, Chief Admin-istrative Officer; Jaren Pippitt, Home Centric Administrator; John Wilson, Chief Treasury Officer; Brady Dubois, President Medical Center. It’s not much of a stretch to declare that Mosaic Life Care sets the standard as an employer in St. Joseph. Not only is it the city’s largest employer (with more than 3,500 caregivers, as employees are known, nearly 3,300 of them full-time), but that staffing is the equivalent of one person for every 13 working-age adults in the entire city of 78,000. Now that’s market influence. And it’s one reason why the health-care system, which operates Mosaic Life Care medical center, considers itself less an employer and more of a big family. Still, Mosaic Life Care lives up to that employer’s responsibility with a healthy benefits package that addresses financial well-being (the average salary for exempt employees is nearly $131,000 a year), and a salary structure that assures competitiveness with peer hospitals nationwide, thanks to twice-yearly competitiveness reviews. Caregivers are eligible to receive quarterly payouts for reaching customer-satisfaction goals, and an annual bonus on top of those treats when the organizational goals are met. Health insurance, as one might expect at a large health-care provider, is a big piece of the equation. Up to 95 percent of medical and vision insurance premiums are paid by the company for dependents and caregivers, dental insurance is 100 percent company-paid for caregivers (up to 95 percent for dependents), and there’s fully-paid life insurance for caregivers and dependents. Health and dental premiums are discounted for caregivers who don’t use tobacco and those who meet targets for body-mass index. Fitness centers with the latest gadgetry, personal trainers and nutritional advisers, daily exercise classes—all at no cost to employees—are available to caregivers and dependents. Accrued time off carries over from one year to the next up to a maximum level that, if exceeded, can be traded for additonal pay. Employees can also donate accrued paid time off to assist colleagues in need. And there’s more: Paternity leave, adoption assistance, lactation facilities, flex hours, an employee-assistance program and on-site concierge services are also available for caregivers. The system’s financial stability is one reason why it’s able to keep offering new services and expanding, as with its relatively recent entry into Kansas City proper with offices at three locations in the Northland. (l-r) Trevor Littlejohn, Facilities/Construction and Finance Manager; Brian Cole, Director of Catering; Christie Glaeser, Director of Human Resources/Training/Bakery Operations; Michelle Cole, Director of Marketing; Eric Cole, Vice President, Operations; Elizabeth Tuttle, Training Manager; Ben Palko, Senior District Manager; Shawn Lollis, IT and Finance Manager. Here’s a measure of career-advancement security you won’t find at many companies: If you want to climb the ladder at Original Bread and you attain the level of assistant manager, you won’t have to look over your shoulder at outside competitors for the next rung—the Prairie Village company, a Panera franchisee, promotes only from within above that level. It’s but one measure of the take-care-of-our-own philosophy that underpins the workplace and benefits package for nearly 1,300 employees. Start with the business model—it’s in the hospitality sector, but there are none of the issues that entangle establishments that serve alcohol. The latest closing among the 34 locations is 9 p.m., so no late-night hours. A family-first principle guides management, which leads to flexible work schedules for the hourly employees and superior quality of life for managers, both pieces tailored around the mandate to meet customer needs. And the job doesn’t stop there: “We measure our success through continual training and development,” says Christy Glaeser, director of human resources. That sector entails a fair amount of turnover among young workers, many of whom are experiencing their first taste of paid employment. As such, Original Bread is teaching those older teens the kinds of skills that will serve them—and other employers—as their careers unfold. For anyone who sees that career right in front of them, the company offers a defined career path. A corporate-approved training café is the setting for prospective managers as they undergo an intensive training regimen. Once you’re on that path, full progression is not mandatory—if you hit a level that ignites your passion, you can remain there; if not, you’re free to achieve and advance all the way to District Manager. The entry-level wage is $8.50 an hour, 17 percent above the federal minimum, and $10.75 for associates. One marker of employee satisfaction in a high-turnover setting is that 175 employees have between 5 and 10 years of service (and 90 more have more than 10). Since its founding in 1994, there has never been a reduction in staff, a period that spans both the post 9/11 recession and the Great Recession. Seated (l-r): Bob Page, President and Chief Executive Officer; Chris Hansen, Senior Vice President, Ambulatory Services and Chief Information Officer. Standing (l-r): Lee Norman, Senior Vice President and Chief Medical Officer; Jon Jackson, Senior Vice President and Chief Administrative Officer; Tammy Peterman, Executive Vice President, Chief Operating Officer and Chief Nursing Officer; Bill Marting, Senior Vice President and Chief Financial Officer; Alisa Ford, Vice President, Human Resources. 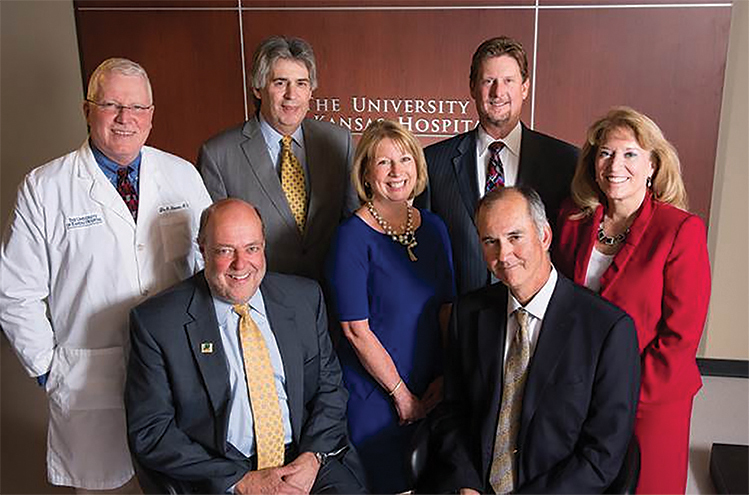 With more than 27,000 people admitted for treatment every year, and 10 times that number of outpatient visits, and nearly 20,000 surgical procedures to execute, the University of Kansas Hospital is all about health. But not just for those receiving that care: The well-being of 7,020 full-time employees and 2,053 part-timers shapes and informs the hospital’s policies and practice as one of the largest employers in the Kansas City region, and the biggest in Wyandotte County. That goes beyond matters of physical health to include all aspects of well-being, including job satisfaction and career-advancement opportunities, financial well-being, and even the spiritual lift that comes from philanthropic and civic engagement. And all of it, says Alisa Ford, vice president for Human Resources, has roots that run to Oct. 1, 1998—the date it was pared away from the University of Kansas system to become an independent public health authority. From that day on, Ford says, “we began working to establish a culture that focuses on excellence in service and quality,” and one that empowers, engages and rewards employees. How? With market-leading compensation structure, as befits the region’s biggest hospital. Structured training for new employees that emphasizes a culture grounded in expectations for excellence and performance, staff and patient safety, and customer service. At the top, the culture is reinforced with biweekly meetings in which system leaders review updates of key measure of quality and service. 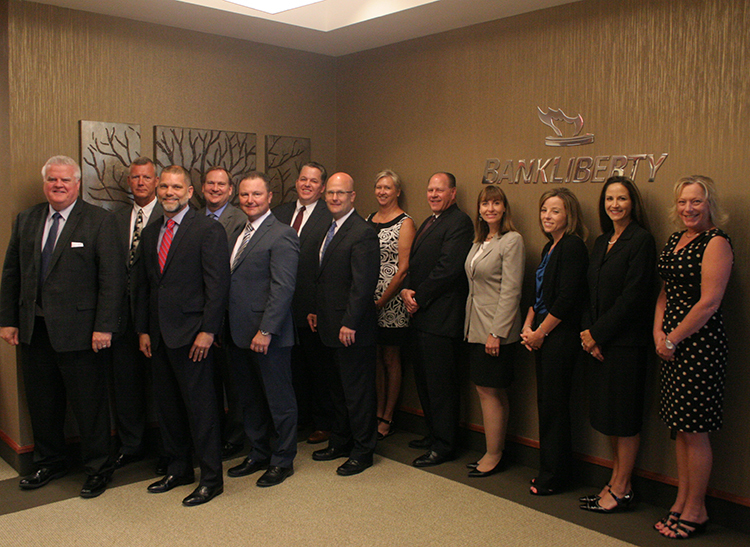 Back Row (l-r) Dan Gutshall, Senior Vice President; Robert Parks, Market President; Martin Weishaar, Chief Operating Officer; Ken Honeck, Chief Deposit Officer; Gail Nace, Payroll and Benefits Administrator; Mark Hecker, Chief Lending Officer; Monica Bolin, Chief Risk Officer; Tiffany O’Leary, Chief Financial Officer; Chris Champ, Senior Vice President; Robin Murphy, Senior Vice President. Social scientists and work-force experts have known for decades that when people feel engaged and appreciated in their roles at work, they tend to be happier, more satisfied, more productive and likely to stay with the organization longer. It does not, however, take a sociologist to figure what’s working for BankLiberty. That approach, she says, empowers employees to resolve issues at any of the bank’s 12 branches before they escalate into something that involves the main office. Result? A highly satisfying customer experience, she says, and process that allows employees to feel as though they are really making a difference. That ties in with the bank’s philosophy of hiring from within whenever possible, a practice made realistic by virtue of the extensive cross-training that creates greater operational efficiencies and, again, raises levels of job satisfaction. Part of the challenge for the company has been extending that culture through expansion—the bank has made four acquisitions since the financial crisis of 2008 set in. Though comparatively small, it offers employees some big-bank perks like tution reimbursement for full-time staff, along with a company-matching 401(k) plan, flexible spending accounts and a variety of health-insurance plans that even include an option for fully-paid coverage. Competitive salaries are made even more thanks to a pay-incentive program, and every full-time employee gets a paid day off for his or her birthday. (l-r): Brian Schell, Chief Financial Officer; Chris Concannon, CEO; Tami Schademann, Chief Reg-ulatory Officer; Chris Isaacson, Global Chief Information Officer. Not pictured: Chris Concannon, CEO; Anthony Barchetto, Head of Corporate Development; Bryan Harkins, Head of U.S. Markets; Eric Swanson, General Counsel. Over nearly a decade of studying what makes companies truly outstanding, we’ve seen a lot of common themes among highly successful companies—pay levels sharply higher than industry standards, awe-inspiring retirement plan contributions, remarkable time-off policies. But we’ve never seen a benefit that works for both employee and organization and is quite as impressive as the education-assistance program at Bats Global Markets. The Lenexa-based equities trading platform (Kansas City’s newest publicly-traded company, by the way), just this past year upped the ante on its tuition-reimbursement levels. For employees seeking post-graduate degrees, it’s now $20,000 per year, with a maximum of $60,000 per employee. And for those who haven’t yet earned a college degree, the company offers $10,000 per year, up to $30,000 max, to get that done. In addition to bonuses paid when corporate goals are met, individuals can cash in again with personal goal attainment. None need worry about the free lunch or free snack/drink station adding unwanted pounds—the company has its own gym, complete with free personal-training classes. A drive-by at Bats is something to celebrate, because it involves an ice-cream truck, and employees get to share in the Bats Crown Club at Kauffman Stadium. And for those with an itch to see more of the world through their work, Bats offers international assignment opportunities, allowing far-flung staffers to remain close and understand the cultures of the countries where the company operates. Front Row (l-r): Fred Weiss, President & CEO; Susan Scholes, Vice President,Marketing. Back Row (l-r): Jason Roberts, Senior Vice President, Customer Success; Troy Anderson, Chief Technology Officer. Mid-size companies had to start off as small ones, but the good ones have leaders who recognize that as the top and bottom lines grow, those responsible for both trend lines need more sophisticated work dynamics. 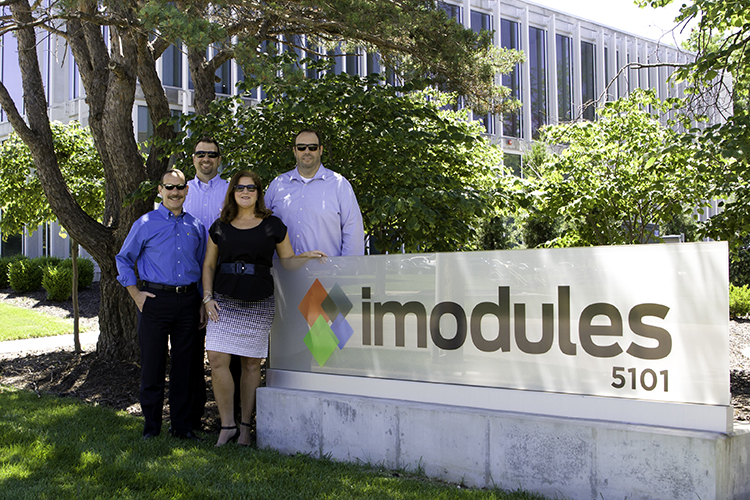 They’ve got that in spades at iModules Software, a Leawood-based IT company that serves clients in higher education with software and services. How many companies in that size range, for example, offer employee referral bonuses of $1,500? Or start new employees with three weeks of paid vacation each year (on the way up the line to a maximum of six weeks)? Or make it formal policy, between Memorial Day and Labor Day each year, to give employees the afternoon off if they’ve hit their weekly 40-hour mark by noon on Fridays? Those are the kinds of innovative approaches to workplace dynamics that can allow companies to stretch their benefit dollar, even if they can’t compete directly with the programs of a Fortune 500-caliber company. work scheduling. As you might expect, it’s a casual work environment—tough to navigate the pinball and foosball games there in a tie or heels—and most every day of the week is some sort of celebration. Truckin’ Tuesdays, for example, entail a food truck parked out front at lunchtime, Fridays dawn with free doughnuts for the staff, and the final Thursday of the month entails an in-office happy hour with food and drinks. An annual chili cook-off and a culture club help build camaraderie, as does peer-selection to recognize outstanding performance, with the winner earning both cash and a reserved parking spot for the quarter. And career-advancement is emphasized by internal-only postings of all job listings, giving those on staff priority for consideration with each opening. Front Row (l-r): Todd Voth, Senior Principal; Missy Ragsdale, Director of Human Resources; Jon Knight, Senior Principal; Gina Stingley, Director of Marketing. Jeff Keas, Senior Principal; Bruce Miller, Senior Principal; Brad Clark, Senior Principal; Michael Lockwood, Senior Principal. One of the great benefits that come with working for global sports-venue designer Populous falls on the day each new stadium or arena is opened for business: Employees who have had a hand in each project are sent—with their families—to take part in that celebration. It’s just one way the architectural firm recognized the contributions of those who have helped it establish its chops as one of the world’s best design firms. But there are plenty of other ways that Populous recognizes those efforts. First, look at the compensation: Each year, the company combs industry data to make sure that its pay levels remain in the upper percentiles for the sector, with a bonus program layered over that. Employees are still kicking the tires on the new headquarters in the former Board of Trade building near the Plaza, where an open floorplan includes plenty of informal gathering spots to foster collaboration, and will soon allow individuals to test their own physical limits when the on-site fitness center opens. In addition to the kinds of well-rounded insurance and vacation packages one would expect from a company with $138 million in revenue muscle to back them up, Populous offers employees both the time and money needed to gain and maintain professional licenses. Around pillars like that Populous has added some thoughtful touches like fitness-program allowances, shuffleboard and ping-pong tables, ticket giveways, an in-house travel agent and print center, and monthly birthday celebrations complete with cake. When each workday dawns, employees are treated to fruit, oatmeal and coffee. Baseball and football tailgates? Got ‘em. An annual staff golf tournament and family inclusive holiday party? You bet. And in addition to Freaky Friday games, the summer schedule calls for adjusted office hours and a 2 day weekend. 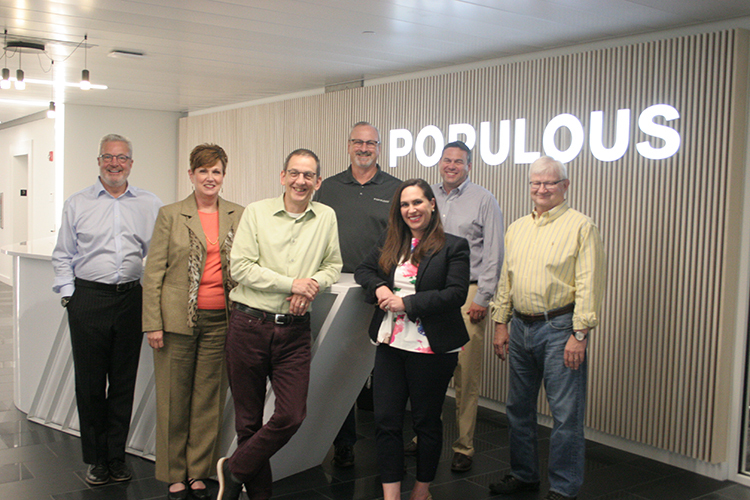 Of course, it can’t all be fun and games, so Populous pushes the envelope on staff training and development with a 20-member Resource Council, charged with examining and implementing best practices for training and design tools. That’s paying off, in part, with 30 percent revenue growth over the past three years, allowing the company to expand operations with new offices in Boston, New York and San Francisco. 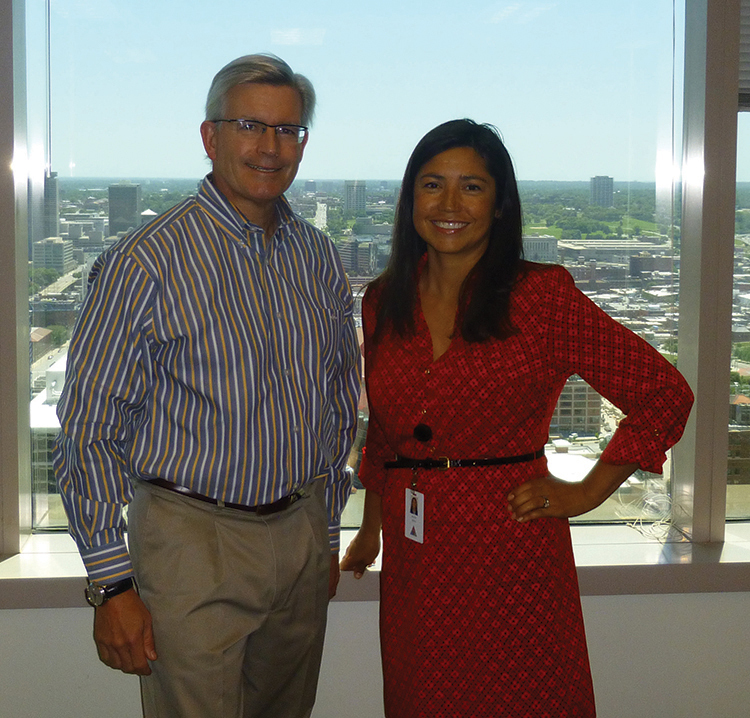 John Martin, Kansas City Office Managing Partner, and Jenny Myers, Missouri Assurance Human Resources Leader. Some companies talk about the need to be more appealing workplaces to the burgeoning Millennial generation. PwC is walking that walk, which is actually pretty impressive for an organization whose corporate family tree has roots 150 years deep. It’s doing something about astronomical levels of college debt, with a new program launching in July to help employees strapped with school loans—$1,200 a year, for up to six years, for all associates and eligible senior associates. Young families—or families-to-be—can look forward to up to six weeks of paid parental leave, and with some flexibility attached to it. It can be used any time within the first year following birth or adoption. (Hint: go for twins if you can, since there’s a two-week bonus for double-duty in the delivery room.) And if you are adopting, don’t overlook up to $5,000 in company assistance with that effort. There are also flexible work arrangements that can be personalized to employees’ needs, and parents even have access to the emergency back-up child care, a maximum of $1,000 a year to cover those days when your carefully crafted child-care plans go south. Naturally, there are the staples one would expect from a global consultancy (the Kansas City office qualifies in this category by virtue of its 243 employees—soon to be 273— based here). Among those are health-care insurance coverage options, life, accident and property-casualty insurance plans, a group legal-assistance plan, and even a mortgage program, all topped off with retirement and savings plans. Career advancement is layered with milestone programs that recognize senior-associate attainment (rewarded with membership in the Discover program to provide coaching on skills needed for balancing career, family and community needs); reaching the rank of manager, with a cash bonus; and the Big Kahuna, adding Director to your title, which comes with four weeks of paid sabbatical to pursue professional or personal goals. And a benefit that all the local employees will enjoy arrives this month, when that office unwraps its newly renovated space with improve technology and larger spaces for collaborative work groups. Seated: Dan Rowe, President. 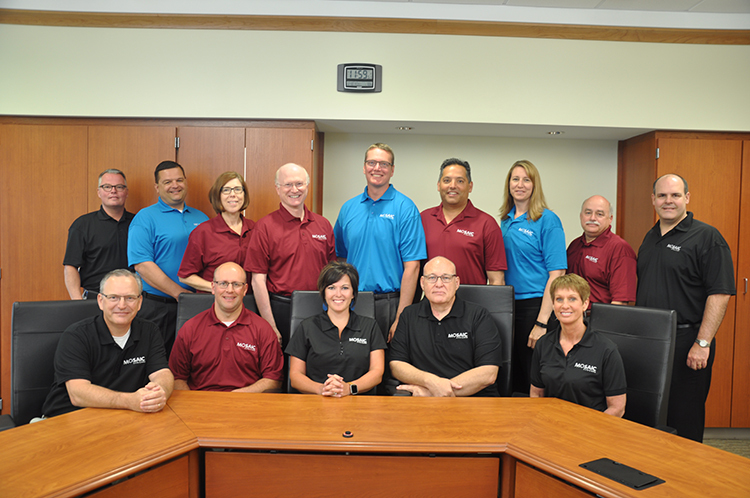 Middle row: Audrie Wenger, Principal; Joe Stramberg, Principal. Top row (l-r) Rick Gannon, Principal; Andrew Pitts, Principal; Michael Treanor, Principal; Nadia Zhiriv, Principal. 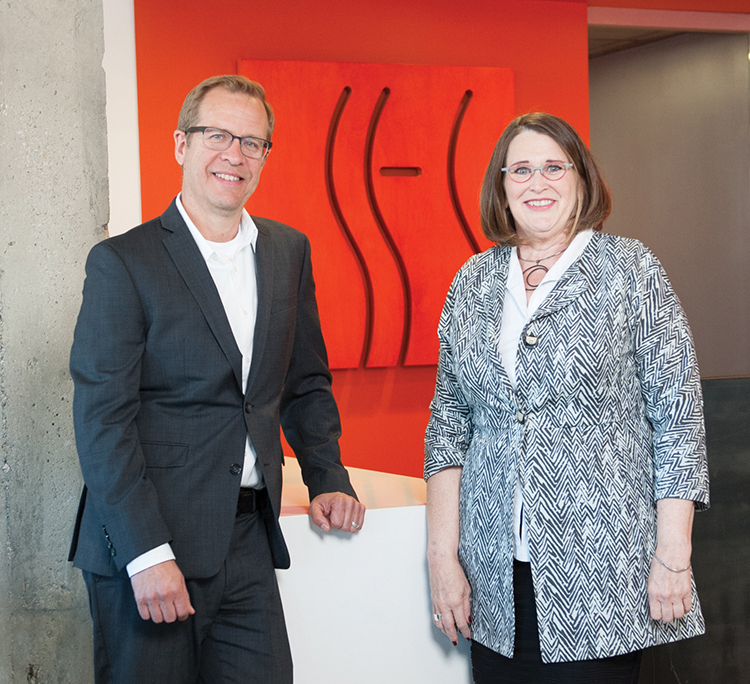 It started as a small design firm in Lawrence 35 years ago, but Treanor Architects is all grown up today. Check that—it’s still growing, but its approach to hiring and retaining top-tier talent is as sophisticated as anything you’ll find among companies with 140 employees in eight locations from Denver to Atlanta. Every year, the firm crunches data from the American Institute of Architects, and those tea leaves produce guidance that informs adjustments on compensation levels designed to reward employees for their skills, qualifications and tenure. Naturally, there’s plenty of other focus on the actual work that has to get done, and supporting those who do it. The firm’s growth-through-learning philosophy is supported by regular one-on-one conversations with key leaders, an annual allocation of professional-development funds, internal mentoring, and mobility within offices, allowing people to ponder career moves to other parts of the country while staying with the firm. 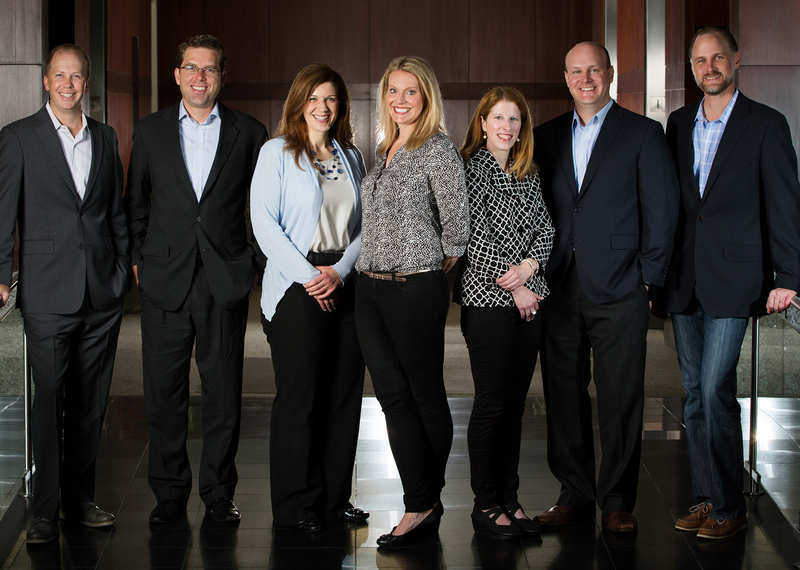 Shareholders (l-r): Adam Seitz, co-founder; shareholders Abe Kean; Jennifer Bailey; Michelle Marriott; Megan Redmond; Jason Mudd; and Eric Buresh, co-founder. Adam Seitz and Eric Buresh had a good, long taste of Big Law to start their legal careers. In 2012, they opted for a different career flavor profile, took their skills in intellectual-property law, recruited some other key talent, and launched their own boutique law firm, Erise, IP. Normally, when you ask a lawyer about maintaining a healthy work-life balance, you can expect to be greeted with a blank stare and a “Say what?” or a peal of bemused laughter. But it’s a foundational concept at Erise IP where nearly two dozen lawyers and staff at the Overland Park offices (as well as a pair of employees in Denver) are bagging big-time clients like Apple, Ford, Garmin and Sony, and doing it in a way that allows them to have the kind of life that makes working that hard worth it all. Just a few of the family-friendly policies in place there: The office closes for two weeks during the Christmas-New Year’s holidays, time that’s in addition to all other vacation provided for employees (and, not insignificantly, meshing nicely with winter break for the kids’ schools). family, here’s a Fortune 500-level perk: A full 12 weeks of paid parental leave. Of course, you’ll find other goodies that drive organizational success, too, such as merit bonus eligibility for all employers, not just the ones with the law degrees. And in this era of corporate scrimping, a health-insurance package with the firm picking up 95 percent of the tab truly stands out. Add all of it up and you get a finely tuned legal machine capable of going from startup to being named “Firm to Watch” award winner by the specialty legal magazine Managing Intellectual Property in less than five years. Seated (l-r): Jenny Swafford, Marketing Coordinator; Dave Williams, Architect, Vice President; Greg Finkle, Architect, President; Alex Callow, Architect; Matt Christensen, Architect. Standing (l-r): John Gaar, Architect; Adam Gerber, Architect; Rebecca Roberts, Architect; Ellen Foster, Architect; Kelsie Kremer, Architect; Whitney Allen, Intern Interior Architect; Joe Mika, Architect; Jason Hansen, Architect. The culture in a science lab petri dish, under the right conditions, will grow on its own. A successful workplace culture will not. It takes a dedicated effort by leaders with vision to fashion an authentic environment of full employee engagement. Key word there: Authentic. You can’t fake this stuff, and if you try to, it’s almost as bad as neglecting the cultural needs altogether. 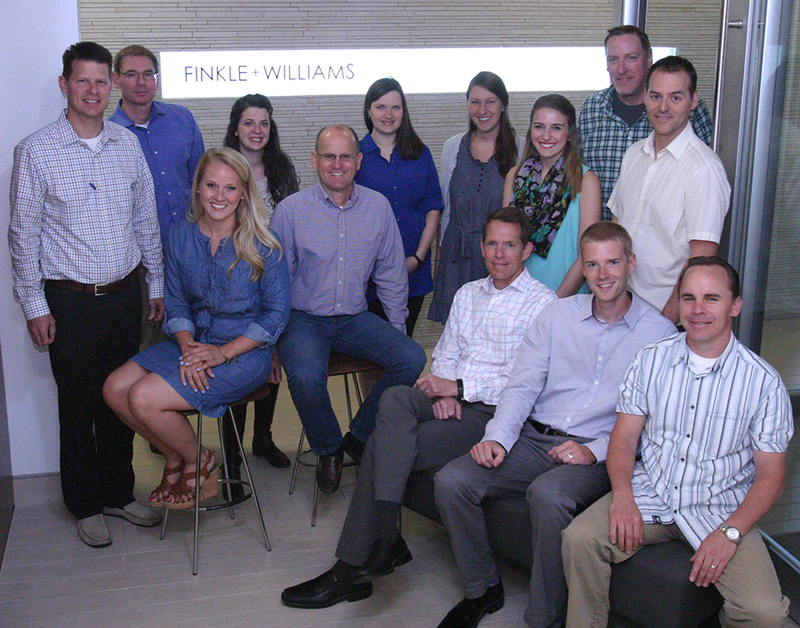 That’s what makes Finkle + Williams Architecture stand out: CEO Greg Finkle and co-founder David Williams are not the kinds to retreat behind big desks. Like as not, on any given day, you’ll find them out in the office, offering guidance to young designers or leading collaborative groups of veterans and recent hires in discussions about aesthetics or working together to set the company agenda. 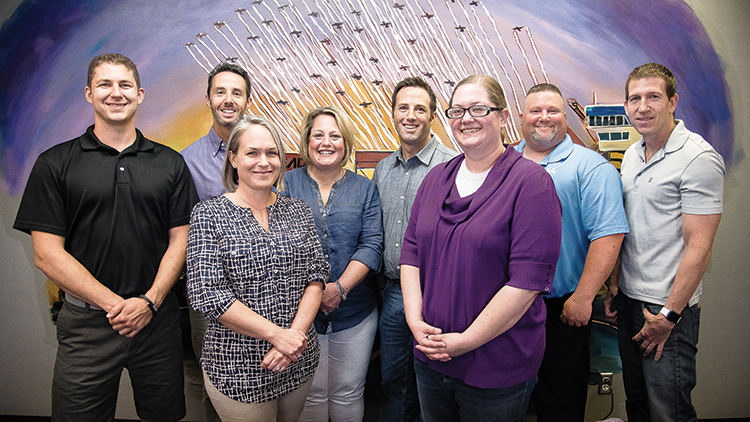 “Our leaders are passionate about what they do, and they inspire employees to have that same passion,” says Jenny Swafford, marketing coordinator for the Overland Park firm, the smallest of this year’s Best Companies to Work For, with just 13 employees. Those employees enjoy a benefit package you won’t see in many companies of that size. Lots of companies strive to provide a competitive wage structure, but what really differentiates the stars is their commitment to layering on top of that. Discretionary additional contributions that are paid in addition to bonuses and the Simplified Employee Pension program have ranged as high as 8-20 percent in some years. And it not only offers medical, dental and vision plans, it picks up 90 percent of the costs for those premiums. Nor can most small firms accommodate three full weeks of paid time off, plus bereavement and military leave where needed—and an extra day off on your birthday is icing on that PTO cake. The Happy Factor, as you might call it, is also part of the culture. The firm’s Fun + Work Committee meets monthly, charged with brainstorming ideas for increasing employee engagement and making recommendations for improving the firm’s policies and practices. Currently on that panel’s agenda: an office health and wellness plan, and a firm-wide professional development plan. Those factors all came together to drive strong growth in recent years—F + W was among the Top 10 in Ingram’s Corporate Report 100 last year. 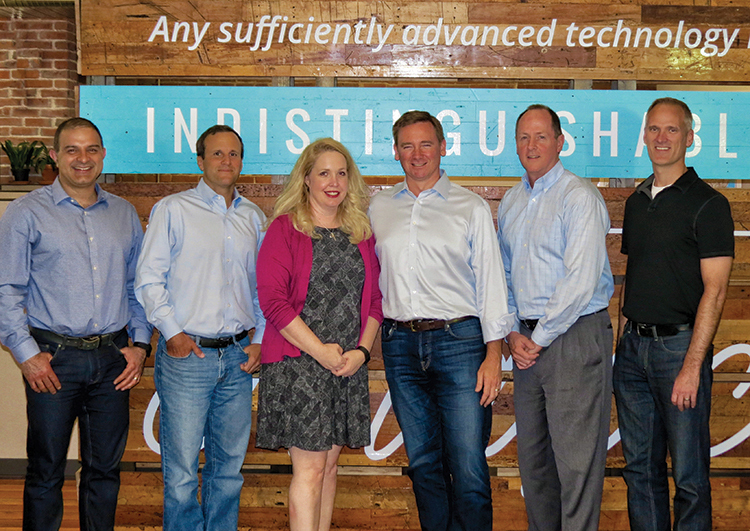 Reza Derakhshani, Chief Scientist; Chris Barnett, EVP Global Sales & Marketing; Amie Logan, Director of Operations & HR; Toby Rush, CEO; Tom Jantsch, CFO; Jeremy Paben, VP of Engineering. It’s tough to beat smart, and even tougher to beat smart plus collaborative. Those two qualities are in abundance at EyeVerify, the four-year-old company that’s making waves by wedding technology with biometrics to produce a new generation of computer security tools. Already, the company has secured 27 client banks, with Wells Fargo coming on board later this year. Its Eyeprint ID 2.0 system provides secure mobile authentication by recognizing individual patterns in the human eye, using images taken by a smartphone camera. As the company says, it’s taking the concept of selfie and turning it into a vital tool that protects your digital life. (This will not be welcome news to the Nigerian prince who keeps e-mailing all of us about his banking challenges.) Since rolling Eyeprint out in 2015, more than 2 million people have become users. Turning that concept into practical reality has repeatedly earned EyeVerify global recognition, and in one competition, a $1 million grand prize. So yes, smart is going to be on your skill set if you want to work here. Retaining that staff know-how means crafting smart benefit plans, too. Founders Reza Derakhshani and Toby Rush have put together a benefit package that covers medical, dental and vision, with competitive costs for the staff of 28. To drive the wellness message, EyeVerify aligns with Humana’s Vitality program, which includes a points system based on a set of measureable behaviors; the company can convert those points to cash for things like holiday-season gift cards. And you’ll find fresh fruit and other healthy snacks stocked in the kitchen. To encourage high levels of employee engagement, the company applies a flexible approach to scheduling—the option to work from home a couple of days a week, for instance, or allowing employees to flex their hours when needed. Far from a sink-or-swim approach to new employees’ being exposed to biometric tech for the first time, the company provides a gradual immersion for those staffers, who hear from leaders about how their respective responsibilities fit into the overall operation, and the Biometrics 101 and 102 sessions with Derakhshani are key parts of that. Seated (l-r): Pamela Burnett, Director, Compliance & Principal Bioanalytical Investigator; Maria Nelson, Director, Finance & Human Resources. Standing (l-r): Abu Siddiqui, Director, Large Molecule & Biomarker Bioanalysis; John Bucksath, CEO; Michael Lanman, Vice President, Operations; Victor Green, Director, Quality Assurance; Yansheng Liu, Senior Director, R&D & LC-MS/MS Services; Dominic Warrino, Ligand-Binding Technical Advisor & Director, Business Development. 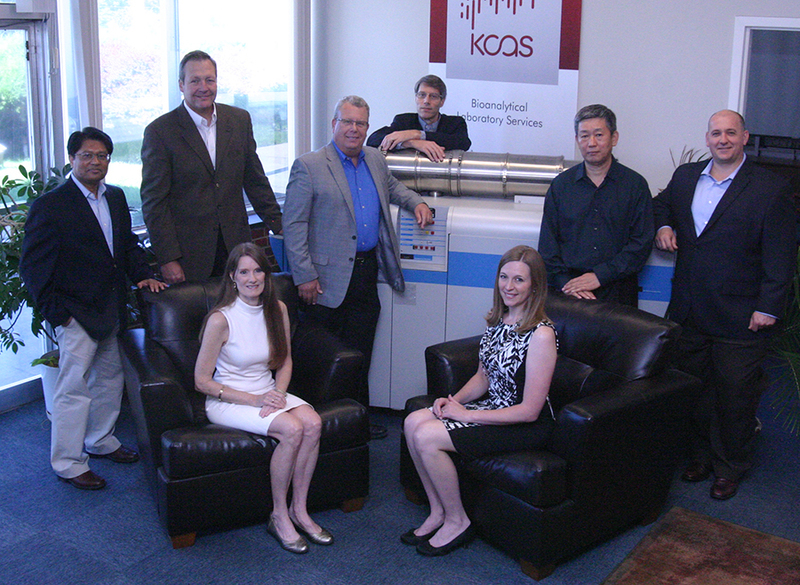 There are good reasons why staff longevity is a common virtue among the 61 employees at Shawnee-based KCAS Bioanalytical & Biomarker Services, where the current average tenure is more than a decade. That kind of staying power is a rarity outside the leadership offices of any small business, and it speaks volumes about the way employees are valued at this contract research organization. What KCAS has achieved is all the more impressive when you consider the amount of staff travel involved to attend 15 research conferences and symposia every year. The value that the company places on finding and retaining the right people is reflected in its employee-referral bonus program: Any employee who refers a successful job candidate receives a cash bonus on the date of that new employee’s hire—and again, on the sixth-month anniversary of that hire. And the Employee of the Month program comes with a $200 cash bonus and a dedicated parking space. The company helps look after the long-term welfare of employees with a compartively sophisticated retirement program that includes a safe-harbor 401(k) with a potential company match of 3 percent of an employee’s annual salary, plus optional after-tax contributions to Roth accounts, with full vesting after six years. On top of that, the leadership may elect to make a profit-sharing contribution, with each employee receiving a payout based on their pay level within the organization. The insurance benefits include both PPO and high-deductible plans that allow employees to tailor their coverage to their personal health needs. And whether it’s employee-only or employee/spouse or employee/children or the whole family, the company foots 75 percent of the bill for those premiums. Same goes for the dental plan; vision coverage is provided at no cost to employees, and there are health-savings account and flexible spending account options (the latter including up to $5,000 for qualified dependent care), plus life, company paid AD&D plans with coverage of up to $150,000 each, with optional voluntary add-ons for higher coverages, long and short-term disability, and prescription-drug coverage. At SFS Architecture, no one goes it alone. 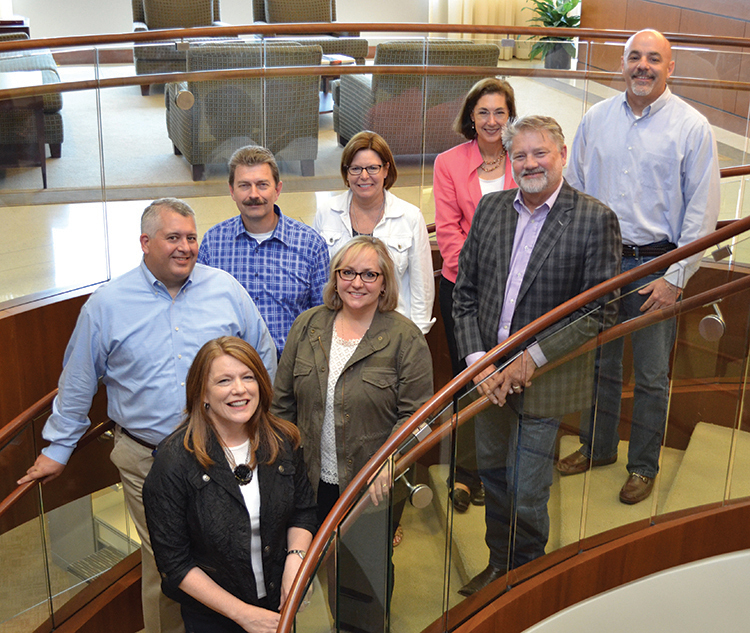 Through a combination of communication, coaching and conviviality, the 43-year-old Crossroads-based firm supports its staff of 26 full-time employees (four part-timers work there, as well), with a range of programs and policies one might expect from a large firm. It speaks, perhaps to the reputation of the broader Kansas City region as a center of excellence for design—if you want to play here, you bring your “A” game. One way SFS demonstrates just that is with its 401(k) program, partnering with the plan administrator to offer seminars on the basics of financial health—reducing the likelihood that outside stresses make their way into the office each morning. Those sessions included spouses and partners, who were treated to dinner and—nice touch, this—babysitting. It matches that level of concern with physical well-being; at the start of the year, every employee received a FitBit activity tracker, and the firm will build in-house challenges to encourage healthy lifestyles, exercise and camaraderie. For a small business, the commitment to taking care of employees also shows up with annual reviews of industry pay practices, so that SFS remains in step with the competition. And employees have the choice of enrolling in medical, vision and dental insurance plans, sharing those costs with the firm, but covered from the date of hire. There’s also group life insurance and a plan to cover accidental death and dismemberment, also effective on Day One. As both partners have been with the firm for at least 25 years, there’s a strong undercurrent of continuity. You can expect that to continue through current succession-planning efforts aimed at bringing on the next generation of leaders. SFS also covers the cost of licensure for the staff, generally consisting of coursework, testing and fees. More informally, it hosts monthly staff luncheons to talk about design or practice management, along with regular lunch-n-learns with industry partners. The Friday Beer:30 sessions and events like Bring Your Dog to Work Day, staff softball and local design competitions also help lighten the atmosphere in the new studio space it moved into last year.